During the Cretaceous period, approximately 100 million years ago the entire British Isles, with the exception of the highest parts of Scotland, lay under hundreds of meters of warm sea. The chalk that lyes beneath the ground in South East Cambridgeshire was formed under the deep marine conditions of that sea when "coccoliths" (skeletons of algae and other organisms which once lived there) were shed from Coccolithophores (microorganisms). This was an extremely slow process, and it is estimated that it took approximately 30 years for just 1mm of chalk to be deposited. glaciers would have worn away the chalk to expose most of the flint that is visible here today. The flint that can be found along the footpaths here has two distinct shapes which indicates what its origins were. The rounded fints were water-worn by either the sea or glaciar meltwater, and the sharpedged flints weren't moved far by the water after the melted ice revealed them. 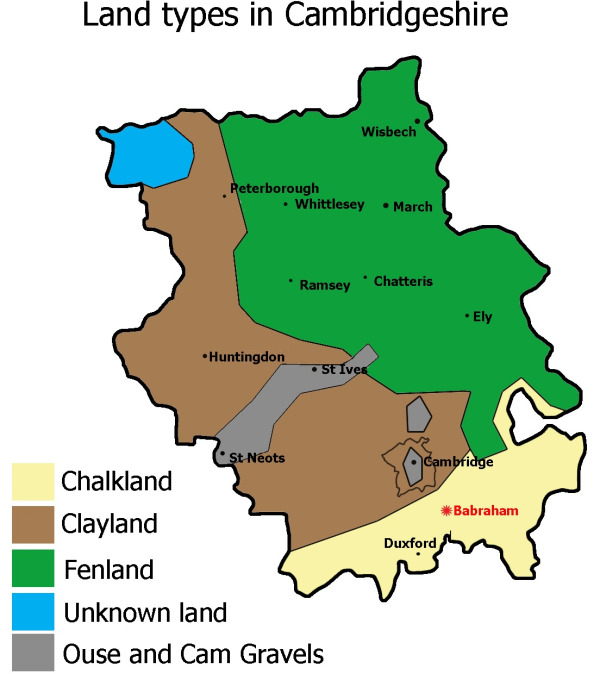 The shape of the South-East Cambridge landscape is sculpted by the chalk formations, particularly in the West Pit of the Cherry Hinton chalk pit, just north of these coordinates where there are very distinct increases in altitude. On the top of these hills, some 4000 years ago were burial mounds, and around 2500 years ago there was an Iron Age Fort built there. Many remains of Roman pottery kilns were found at the fort site along with an Anglo-Saxon cemetary showing buirals from AD700. The Chalk of the nearby Gog Magog Hills to the east of Cambridge forms the highest part of the County, rising to 400ft. The chalk in this area was very important as local industries relied on the chalk which was taken from quarries such as nearby Lime Kiln Close, with the quarrying possibly dating back to Roman times. In the Middle Ages these quarries would have been one of the main sources of hard chalk for the construction of Cambridge churches and Colleges. Chalk from here would have been used for construction of the Great Gateway at Trinity College, parts of Peterhouse, and the Chapel at Corpus Christi. The chalk was also heated in kilns to make lime for use as mortar and as limewash to improve soil fertility. Lime Kiln close next to the Cherry Hinton Chalk Pits was abandoned 200 years ago and now woodland has developed. In the warm, dry, chalky soil of the West chalk pit, rare plants flourish. In particular there is "Moon Carrot", a plant with large white flower heads similar to Cow Parsley, and "Great Pignut" which is similar, but more delicate. The East Pit which is the largest due to it being quaried until the 1980s is now home to more than 60 species of bird. This porous chalk can also act as an aquifier to clean the water that flows through it. At the top of Lime Kiln Hill there is a pump and reservoir that supplies drinking water to the people living nearby, and the spring-fed streams and lakes provide water for the wildlife. At the coordinates for this earthcache, some 4 miles away from where you will find the chalk pits you can still see exposed chalk towering high at the side of the road, showing how many of the hills in the landscape are composed. 3. Describe the colour and texture of the small chalk cliffs that you find at these coordinates. 4. The chalk is visible to the left and right hand sides of the road. 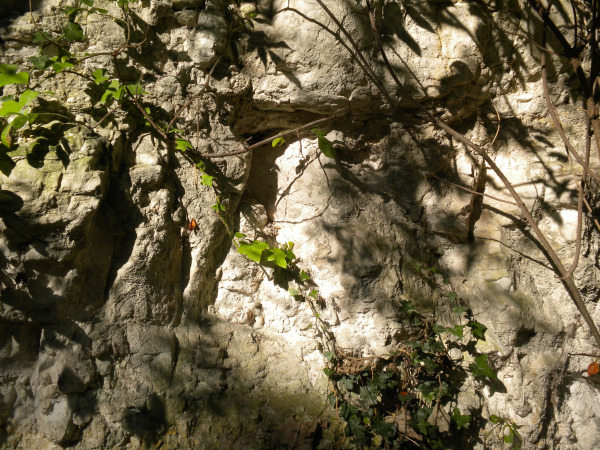 Estimate the height of the highest part of the exposed chalk cliff. 5. Take a photo of yourself or your GPSr with an exposed section of the chalk in the background. Post this in your log. Please don't post the answers to questions 1-4 in your logs.